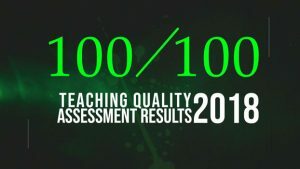 In an assessment of teaching quality 2018 that was conducted by the Quality Assurance Directorate at Ministry of Higher Education, Kateb University scored 100/100. We congratulate The Kateb Board of Directors, The Chancellor, Vice Chancellors, Faculty Members and Staff Members on this big achievement. We also thank every member of the Kateb Family who have tirelessly contributed for making this happen. The Public Relations Office at Kateb University.